You are here: Home / Soups & Stews / Soup to keep you warm! Although it may not seem like it yet here in Florida, cooler weather is on its way soon. As the weather cools it’s time to enjoy more warming meals, like soup! 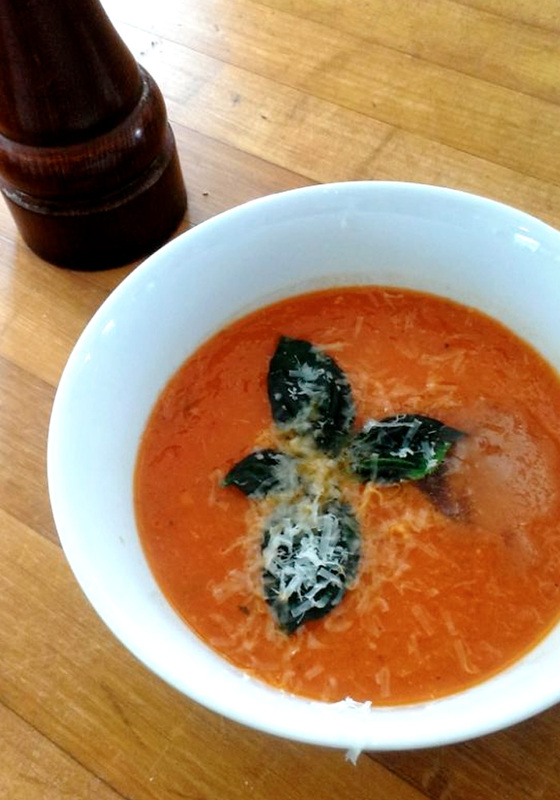 In anticipation of those cooler nights, I have provided this delicious Tomato Basil Soup recipe. I find this very peculiar but my friend John likes to top his tomato soup with popcorn, to add a crouton-like crunch. It certainly makes things interesting. Melt butter in large saucepan over medium heat. Add chopped onion, shredded carrot, garlic, and shallots to pan. Cook 5 minutes or until vegetables are tender, stirring frequently. Add sugar, pepper, salt and 4 basil leaves and cook 5 minutes. Add sun-dried tomatoes, diced tomatoes and broth and bring to a boil. Reduce heat and simmer one hour. Remove from heat. Blend in blender or with immersion blender until smooth. Divide among 6 bowls; garnish each serving with one basil leaf, fresh grated Parmesan, a drizzle of basil oil, and fresh ground black pepper.